All my Susan Bates row counters are red. I have one of those Clover rectangular kacha-kacha "clicker" type counters and it is red as well. I find myself wishing that row counters came in more than one color. Why you ask? Simply because I am working on projects that require 2 row counters. I used two row counters for my Mom's vest (last seen here, I still have to blog about the finished vest when I find some time to focus on that post), in the armhole shaping section where I need to keep track of the Block I'm knitting and the Row in that Block. I placed two RED row counters on the needles to keep track of each, however they sometimes fell off the needles and that screwed me up. I was also working on a cable project, last seen here, that contained three different cable patterns, with two different row repeats. That would be 20 rows and 24 rows. I used two row counters where one kept track of the 20 row repeat and the other kept track of the 24 row repeat. My challenge was trying to prevent these row counters from flying off the needles. And I really do mean flying! It's because I started that project on 3.25 mm (US3) size needles (then later switched yarns and needles). What I would like are row counters that are available in a wide variety of colors. I can work with them visually, and it would help me remember that Red is for Pattern 1, Blue is for Pattern2, Purple is for Pattern 3, etc. Surely there must be such an animal out there. I just haven't found it yet. As for the rectangular "clicky" type counters. I think these would be great in a variety of colors too. They'd be even better if they were silent clickers, so I can use them while knitting in bed without disturbing DH sleeping. I don't think I'm asking for much here. They can send a man to the moon. Surely they can make row counters multicolored and silent. Of course I also think that we should have better technology to harness the sun's power, and that doesn't seem to be happening. I often find things when I'm not actively looking for them. A while back, I stumbled upon the Clover row counters while looking for something else at Jo-Ann. They're differently red from the Susan Bates counters, different enough so that I can place one Susan Bates and one Clover on the same knitting needle and would still be able to distinguish them. I think I passed them over in the past because they cost twice as much ($4) as the Susan Bates ($2). I picked up three Clovers. 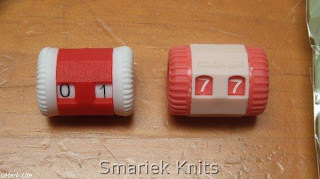 Knitting row counters. Susan Bates on left. Clover on right. Here's a photo showing both row counters. You can clearly see that they are easy to tell apart from their coloring. Well, that's a start. But there is more!!! There is something I didn't know about these Clover row counters. 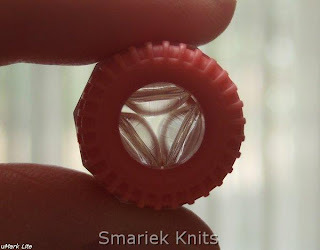 Their design is superior to the Susan Bates counters in that they have "cushiony" parts on the inside that better grip the knitting needle. I slipped one onto my 3.25 mm (US3) needle and it DID NOT SLIP OFF! Yay! No more row counters flying off the needles. No more having to crawl on the floor to retrieve a row counter from under the coffee table or sofa. Clover row counter, center detail. The photo above shows a close-up of the inside of the Clover row counter. See the three transparent cushiony parts? These grip onto your knitting needle so the row counter doesn't fly off. Susan Bates row counter, center detail. Here's a close-up of the Susan Bates row counter. It lacks the "gripping" innards that makes the Clover row counters so much more superior. I wish I had known about this before I bought a gazillion Susan Bates counters. If you have some pretty beads on hand you should check out Alison's post about how she made bead row counters. I'd love to try this out if I can get my hands on some beads I like. Of course I have no idea where to get beads in my new city. Well, I don't know where to get beads in my old city either, but I do recall there used to be a bead store (many years ago) on Castro Street at Market Street, just a few doors down from the Castro Theater (in San Francisco, CA). I wonder if it is still there? I did see a few beads at Jo-Ann, but nothing I really liked. Let me know if you can recommend bead shops in the Cupertino, Mountain View, or Sunnyvale area. I've heard of the bracelet type row counters and the "rosary" type row counters, both types are available from various sellers on Etsy. Both look like jewelry. I don't really understand how the "rosary" type row counters are supposed to work if you want to count more than 10-row repeats, however I do like how they remain with the knitting unlike the bracelet types. This row counter may be the better solution. This would be a cinch for anyone who already have the special tools necessary (viz. those who are into beading/jewelry). I think this row counter is exactly what I want. It's perfect for counting 40-row pattern repeats, and with two different sets using different colored beads, two of these can be used to count 2 different pattern repeats within one project. Unfortunately I don't know if this row counter flavor is sold anywhere and I don't have the skills or tools to make one of these myself. I won't know if these "jewelry" row counters are practical until I try them out. Until then, I am pretty happy with my new Clover row counters. I have the same problems with row counters flying off the needles. So now I just pin them to the knitted fabric. Slip onto a stitch holder or extra large safety pin. I just move them up the knitting on the column I'm counting. I am hoping you received my email, I would like to send you a green stitch counter, would you be so kind as to contact me if you will accept this gift. Thank you so much for creating such a wonderful blog. Good luck finding the perfect solution! I don't think I've ever made anything that needed more than one row counter - I'm impressed! Thanks for mentioning my bead ones - they have served me well. That's funny, my row counters are blue and green, I don't have any red ones. Check into Global Beads which is in Mountain View on Castro Street. They have a decent and somewhat eclectic range of items. Surprisingly Michael's seems to be upgrading their beads and supplies sections as well, so you might want to check them too. I usually get most of my beading stuff online at Fire Mountain Gems - great selection and good prices. There's a bead shop in Cuptertino next to the Mervyn's there at Steven's Creek and De Anza called 3 Beads & a Button. I used to work right across the street from there, it's a nice shop. They have classes too which I am trying to resist getting into. I have enough hobbies already! I know there are blue row counters, I saw some pics on Wendyknits blog recently. Not sure where they come from however! There is also a row counter that clicks (not sure if it makes sound or not) that is available from Daiso but I was unable to find it the last time I went in one (my best friend has one and I covet it). I seem to do better with my (inherited from my mom)peg board type of row counter...not exactly sure what it's called. Ooo, that's clever! 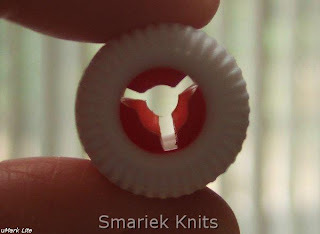 I hate it when my row counter goes flying off my needle, and they're just small enough that they're difficult to find. I'll have to get some of the clover ones when I next have a JoAnn's coupon. Thanks for sharing! Aerial row counters! I can never remember to click my row counter, heh. What about some nailpolish on the row counter? I did that with some dpn to keep them straight. The beaded ones work by having large and small beads, and once you pass 10 small ones, you move one large one to rep. 10, and then keep on with the small ones again. I have a Susan Bates peg style one that has sections for pattern/increases/decreases/rows, but I find the pegs aren't always secure! I've also made the 'rosary' type of counter, just with beads, jump rings, etc from Michaels. Very Important Point: don't pull jump rings apart like a binder ring. Push the two ends away from each other, one toward you, one away, then squeeze them back into one 'line'. THat way it's easier to get the join between them to be as tight as possible.